First Time Mama - First Time Blogger: Happy May and our new toy. Happy May and our new toy. Brian and I have lived in a lake community for 9 years now. Every year, when summer rolled around, we would say to each other, "We should buy a boat". We love the lake and all the activities it has to offer, how beautiful it is & how much fun it is during the warmer months here. We never bought any floating things because we had hoped to move out of this area for several years now, however it's become crystal clear that we will be here for a while due to the horrendous housing market in our area. So, because of this crappy housing market, we decided to pull the trigger this past winter. We started boat shopping & researching late summer of last year. Originally we thought we would just buy something used, and then it slowly turned into "Let's buy something new since we'll be keeping this for a long time! Let's get what we really want!". 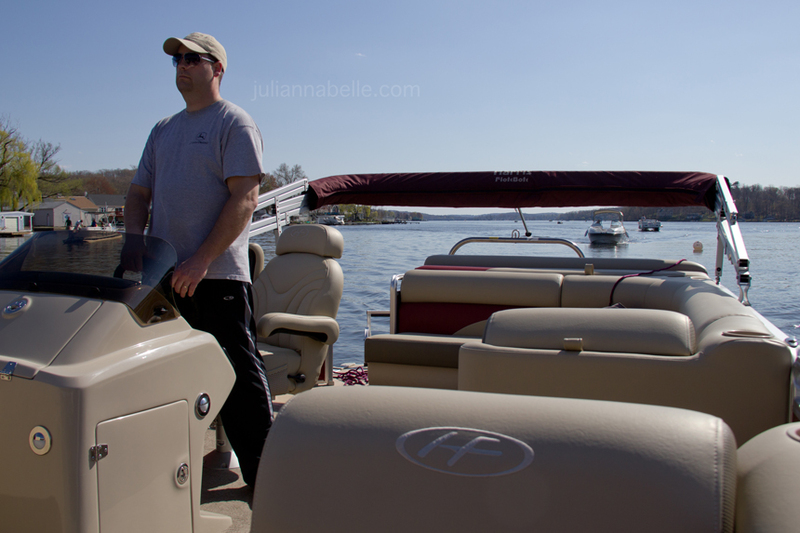 We 'test-drove' a new Harris Flote-bote (pontoon) last August and loved it. That's what made us decide to go new and get what we want with the options we want. Hey why not?! You only live once right? 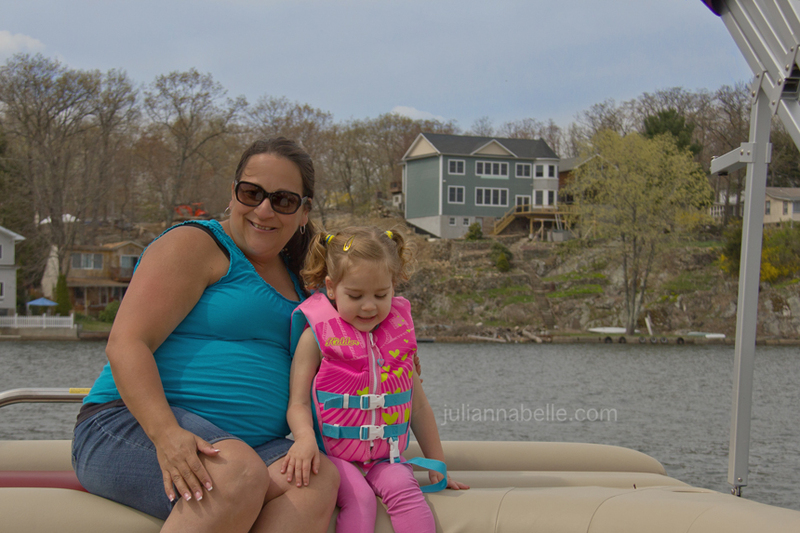 We actually test-drove a boat (sounds kinda silly saying test drive!) 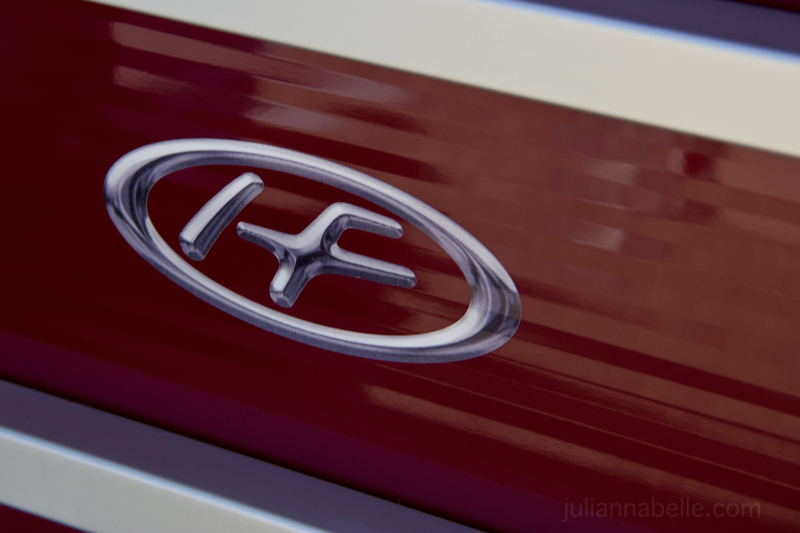 but liked the next model up, which last year was priced too high for us. 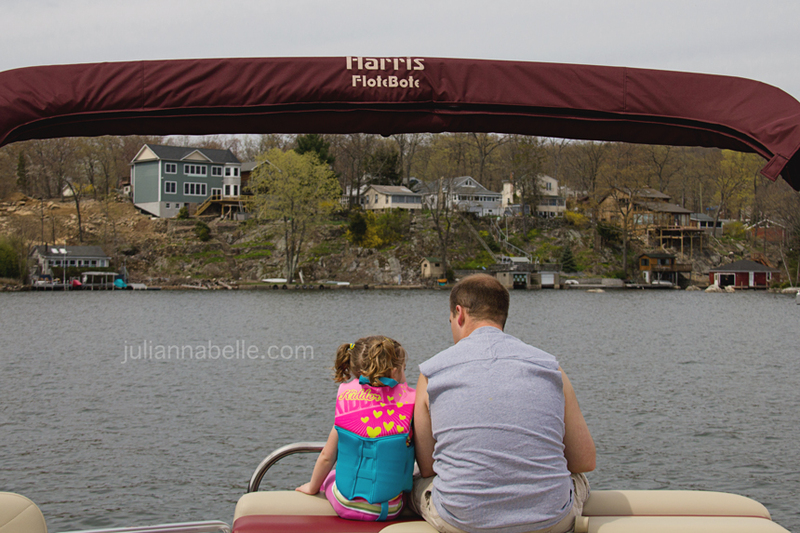 We checked out a few other pontoon boats out there, but always came back to liking Harris. Well. Brian stopped into the dealership over the winter and the "higher" Harris model was marked down drastically as a 2012 leftover. It was meant to be. We got a great deal and bought it. Who buys a boat in December?! So there it sat all winter, shrink-wrapped and covered in snow. 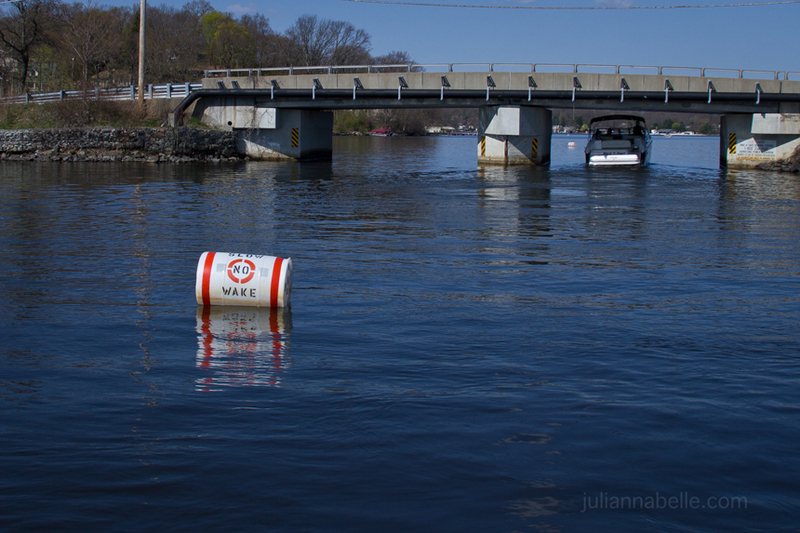 We shopped around for a marina to dock our boat for this season and found a really amazing marina by our house that has dock-hands that help you leave/enter your slip, tie up, cover your boat, and anything else you need help with. It's a fantastic service they offer! Spring couldn't get here fast enough. We finally were able to launch on our maiden voyage last weekend.... Brian and I were so giddy like little kids! My mother watched Julianna for the first time out and then we took Julianna with us the next day. She loved it. Let me just tell you. BEST. DECISION. EVER. And for those of you wondering. Yep, the baby will be out there with us this summer as well! We still have to name it... it's no-name for now. As much as it pains me to put this picture out there... I guess I want to document our first weekend, so I need to put a picture of Julianna and I for the record. 9 months pregnant! Daddy teaching Julianna that safety comes first. 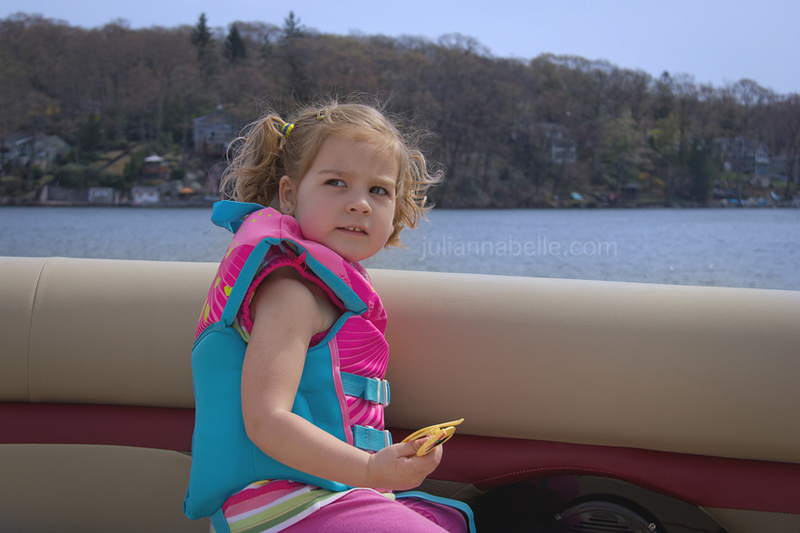 She must wear her life jacket always. Luckily she loves it! The kid loves being out on the boat ride! Anchored for lunch... high fiving Daddy! This little visitor hopped on while we were eating lunch. I got the feeling it wasn't her first rodeo. She was going to steal our food when we turned away no doubt! haha! Julianna screamed "Daddy there's a duck on the boat!" - she thought it was the funniest thing ever. 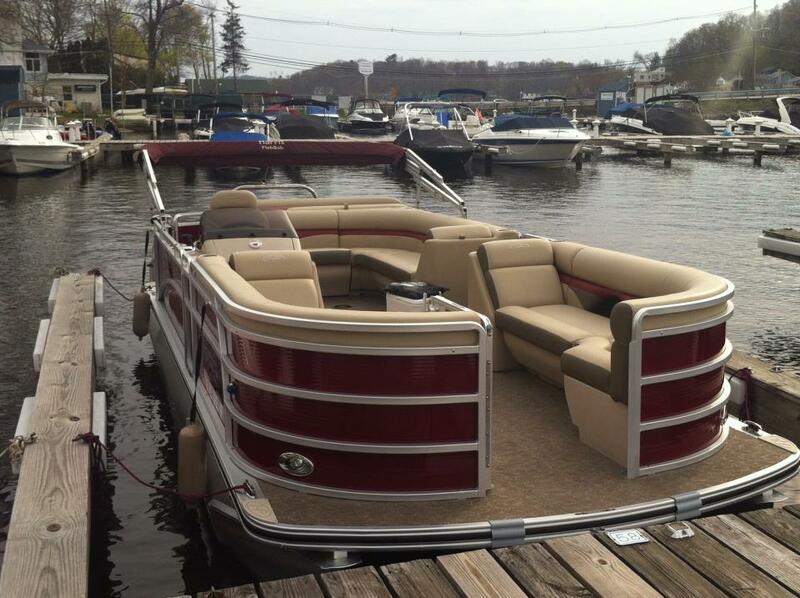 A new boat; I'm soooo excited for you guys and a little jealous at the same time ;o) I would love this boat! Looks so comfy! Your pictures are fabulous as always! Love that one of J and her Daddy high fiving each other! 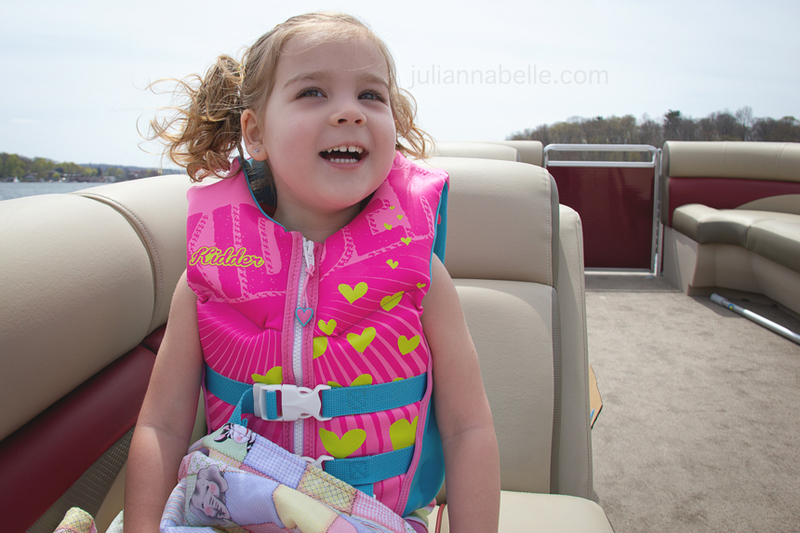 It's so great that J loves it and wearing her life jacket :o) I bet you can't wait to take the baby on it! What a pretty boat! I'm glad you posted the picture of you and Julianna on the boat. You look great. 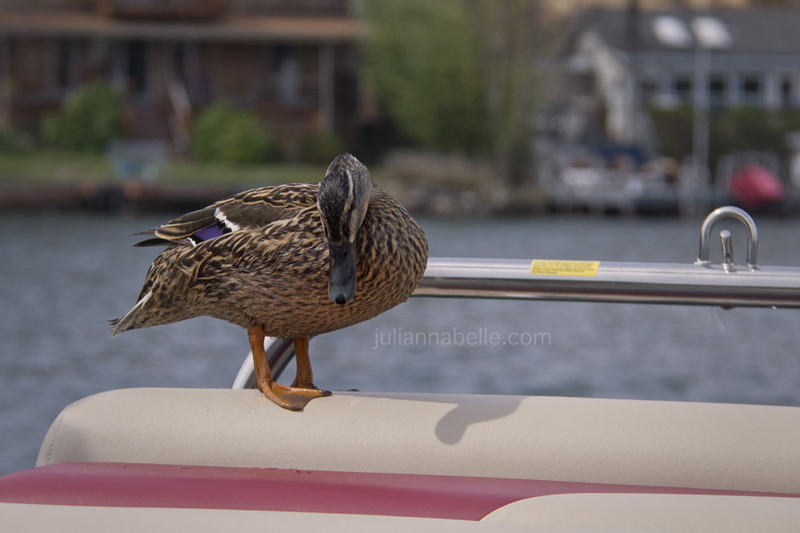 I can't believe that duck jumped on board...what a brave lil' critter. You'll have to take stale bread next time to feed the friend. FUN!!! What a great treat for all of you--I think I would have been dying all winter to use it! thanks yes fun indeed! We were totally dying this winter for spring LOL - could not wait! !